Congratulations on your acceptance to Washburn! The Office of International Programs (OIP) looks forward to welcoming you to Washburn University! We are very glad that you have chosen Washburn, a university of approximately 6,200 undergraduate and graduate students. There are over 225 international (F-1 and J-1 visa) students on our campus from over 30 different countries, and these international students play a very vital role on our campus. The Office of International Programs (OIP) has prepared this Pre-Arrival Information Guide for new incoming international students, which contains important information about: reporting to WU, orientation for F-1/J-1 students and short-term scholars, obtaining your visa and arriving in the U.S., our city (Topeka), the university, local weather, local housing options, transportation and health insurance/health care in the U.S. The Office of New Student Orientation has prepared a New Student Orientation Book for all new incoming Washburn Ichabods! (Not sure what an Ichabod is? Check out page 7 for more information!) This book includes important information about: Washburn’s history, your student identification card (called an iCard), campus safety, degree requirements, classroom expectations, academic advising, student clubs and organizations, living on-campus (Residential Living), Dining Services, the Student Recreation & Wellness Center (student gym), Student Health Services, Washburn Athletics, Topeka Metro (bus and bike transportation options), campus map, and other support services at WU. The Office of International Programs has developed an on-line pre-arrival orientation through Desire2Learn (D2L), Washburn’s online learning platform. All new international students coming to WU are required to complete this pre-arrival orientation before arriving on campus. More information will be sent to you by the OIP approximately two months before the beginning of your program. 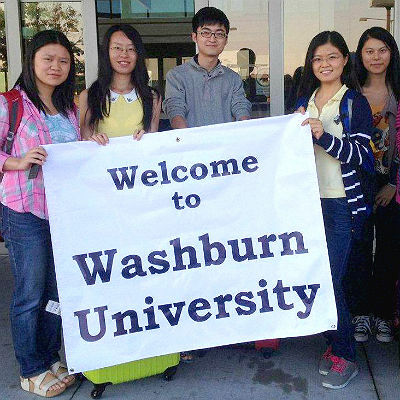 For newly arriving Washburn international students, the Office of International Programs (OIP) will arrange free airport pick-up and transportation to the WU campus for students arriving into Kansas City International Airport (airport code: MCI) on specific dates before Orientation Week. For Fall 2019, the OIP will offer this free service for new international students arriving on August 11 or 12. The required new student orientation week will be from August 13-16. If you wish to sign up for this service, please click on International Student Arrival Information Form. There is a required New International Student Orientation Week for new F-1 students and J-1 exchange visitors a week before the beginning of the Fall and Spring semesters. The purpose of this orientation week is to help new international students and exchange visitors adjust more easily to life at Washburn and in the US. New Student Orientation for Fall 2019 Semester is August 13-16, 2019 with classes starting on Monday, January 19. The Office of International Programs encourages new international students to prepare and inform themselves as much as possible before arriving on campus. Provided resources include the Pre-Arrival Info Guide and New Student Orientation Book (available under Pre-Arrival Information), as well as the online Pre-Arrival Orientation through Desire2Learn (D2L) which will be sent to all new students approximately two months before the start of their program. Health and safety in the U.S.